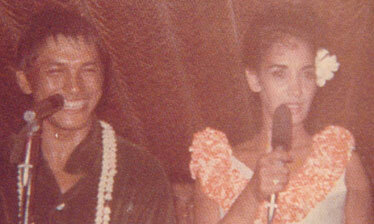 Nani Lee Meadows, sings with her late husband Kui Lee in this courtesy file photo. She died yesterday at 76. Nani Lee Meadows, widow of singer and songwriter Kui Lee and an entertainer in her own right, died yesterday after battling cancer for several years, her family said. Rose Frances Naone Leinani Lee Meadows was a singer and hula dancer who performed on the East Coast in the 1950s and in Waikiki in the 1960s. She met Lee, who wrote the song "I'll Remember You" for Don Ho, in New York. He was a knife dancer and choreographer when both performed in the Hawaiian Room of the Lexington Hotel. "She was one of those local girls that had so much personality. She had the passion and loved to dance," said Lani McIntire, a longtime friend. "That's why Kui fell in love with her, I guess." Returning with Lee to Hawaii in the 1960s, Meadows performed with her husband at Andy's Ebbtide in Kailua and with Don Ho at Honey's and was featured on the Don Ho Greatest Hits album. In the 1960s, sometimes with her husband, she performed with Sterling Mossman's Barefoot Bar Gang at the Queen's Surf in Waikiki, with Zulu and the Son's of Hawaii at Queen's Surf, at Kanaka Pete's in Maui, and with the Tommy Sand's show at the Outrigger Waikiki. After Lee died of cancer in 1966, Meadows continued performing and raised their four children. McIntire said Meadows was a giving person and recalled her weekend parties in the 1970s at her Kaneohe Bay home with her second husband Barney Meadows. Entertainers from across Oahu and the neighbor islands would gather at the couple's home to play music and dance. Gary Aiko, son of the late singing legend Genoa Keawe, played bass and sang with Don Ho's band at Honey's. He met Meadows when she joined the band in the late 1950s. "The way she sang, that was quality," he said. "She was vivacious with always a smile on her face and good humor," McIntire said. "She was like that when she got older. She never changed." Meadows moved to Kau on the Big Island with her late husband. Meadows is survived by daughters Wailana and Mahealani Lee, and Maile Lee-Tolentino; son Kimo Lee; sister Elizabeth Bailey; brother William Naone; 11 grandchildren, and two great-grandchildren.